(Former) Public School 64 was designed by master school architect C.B.J. Snyder in the French Renaissance Revival style and built in 1904-06. This was a period of tremendous expansion and construction of new schools due to the consolidation of New York City and its recently centralized school administration, school reforms, and a burgeoning immigrant population. As the school board’s Superintendent of School Buildings, C.B.J. Snyder created a large body of innovative and beautiful school buildings that served as visual reminders of the important civic role of public education. P.S. 64 is designed with Snyder’s innovative H-plan, which he created to provide light and air to classrooms in schools built on mid-block sites in congested city locations. With the H-plan, schools were organized around two courtyards that 2 also helped insulate the classrooms from city noise. These courtyards provided the luxury of open space in densely packed neighborhoods and the schools became immediately recognizable symbols of civic pride and benevolence. Additionally P.S. 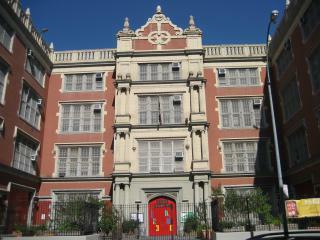 64 is one of the first and the oldest extent elementary school to include an auditorium with direct access from the street. This innovation was introduced by Snyder in 1903 and allowed schools to function as community centers, as they began to take on an expanded role in the lives of the people of the neighborhood. The auditorium provided a generous public space for evening lectures, and educational programs that helped acculturate the area’s large numbers of immigrants to their new country. By setting the auditorium partially underground and using its roof as a play yard, Snyder was able to create more useable space in an already cramped lot. Throughout its history, the auditorium of P.S. 64 was frequently open to the community, serving as the venue for cultural lectures, political speeches, and theatrical events. As a school, P.S. 64 was noted for educational innovation and experimentation. Its second principal, William E. Grady, was a supporter of the Ettinger or Pre-Vocational Plan, in which seventh and eighth grade students received vocational training as a way to enrich their curriculum and try to keep more students interested and in school. The founder of the progressive Little Red Schoolhouse, Elizabeth Irwin, taught at the school from 1912-21 and during this period devised a classification system for students predicated on the scores of their IQ tests. Distinguished alumni of P.S. 64 include Yip Harburg, who wrote the lyrics for The Wizard of Oz, Sam Levene, who played Nathan Detroit in Guys and Dolls on Broadway, and film director Joseph Mankiewicz. Architecturally, P.S. 64 is a unique example of Snyder’s work in the French Renaissance Revival style. Because Snyder was under severe pressure to produce large numbers of school buildings to house the fast-growing population, he occasionally repeated similar designs in other locations, but there is no school design like P.S. 64. Its keyed surrounds, slate-covered mansard roof, terra-cotta moldings and keystones, contrasting brick and stone materials, and pediments filled with fruit and foliage resulted in a visually prominent school building. This distinguished structure and its distinctive plan and siting in the middle of a crowded neighborhood of tenement buildings helped create a strong statement about the importance of education and the importance of the building itself in the crowded immigrant neighborhood. P.S. 64 was designed while Snyder was at his creative and inventive peak, and is an unusually intact example of a school building from this early period. The school board closed the school in 1977 but, in the spirit of Snyder’s original vision, the building continued to function as a busy community center. Just as it had served as a center of education and acculturation for European immigrants of the early twentieth century, this building was adapted to the needs of a new generation of immigrants. It was taken over by CHARAS/El Bohío a group formed in the 1960s to meet the needs of the Latino community. They used the former school for classes, meeting rooms, performances, rehearsal space, art studios and galleries to foster and promote local culture and community. As El Bohío, this building served as an area focal point for the broad-based, citizen’s movement to preserve the buildings and the community of a poor and minority neighborhood despite its deterioration and the city’s fiscal crisis of the late 1970s and 80s.